Hi everyone, my name is Victoria Van Zandt and I am a licensed MFT and art therapist in Los Angeles. 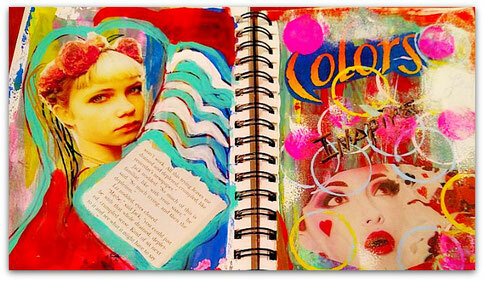 The name of my art program is Art Therapy LA. I lead monthly Women and Creativity Workshops for women of all ages to explore and nurture their creative and artistic sides and to gain deeper insight in to themselves. 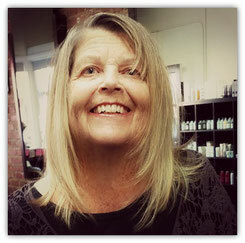 I am an artist, writer and have a private practice here in the city of angels. I also offer my art workshops to other organizations. I work with women primarily and find art making to be powerful tool in helping them explore the critical and judgemental voices that can create inner conflict. Art helps them gain insight and express feelings they might not know how to verbalize. Please share a descriptive “snapshot” of one of your art sessions, your studio/workspace, and describe the emotional “atmosphere” of your sessions. 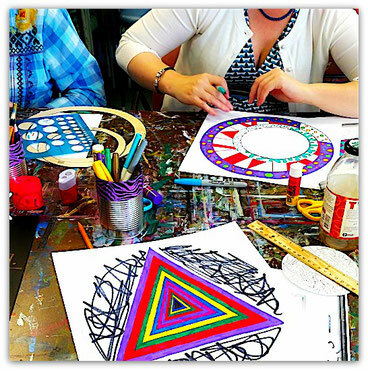 A typical session includes women coming together to create art using mixed-mediums, mandalas, and paint to have fun, explore thoughts and feelings and create communications. Women from varied backgrounds, ages and art experiences vary and everyone becomes engaged and connected through the art making process. 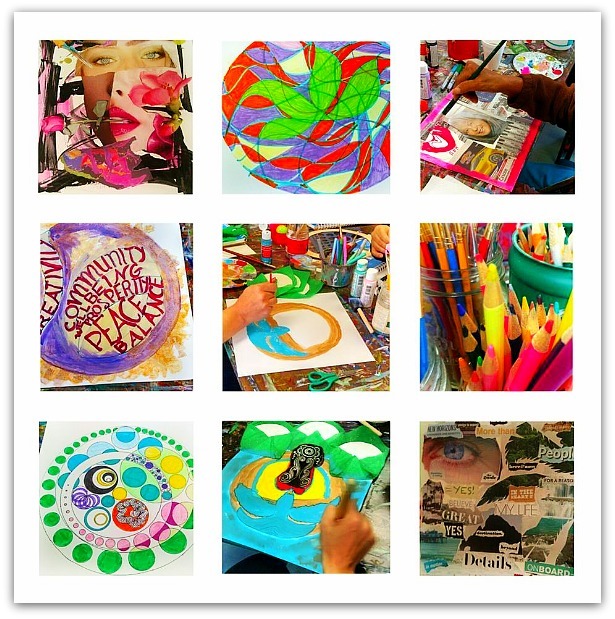 I create a fun, safe and open space for sharing with no “shoulds.” The art space I use is the art therapy room at an outpatient adult daycare center. The space has an outside area and a wonderful inside long art table that seats 10. There is room to spread around, sit outside and add other tables. It is bright and comfortable. I begin each 3 hour session discussing how the art making in this workshop is process-oriented verses product- oriented and that there is no right or wrong way to creatively express yourself in this workshop. I talk about it being a place to explore instead of judging and to be aware of the critical voice if it surfaces. Each woman introduces herself, sometimes by a small mandala card she makes including a symbol of herself, and we talk about confidentiality. Could you share an example of an art directive or an art theme that you might typically use in your art program? I use themes to create structure and free space for participants to bring their own art to work on or to freely use any mediums available. 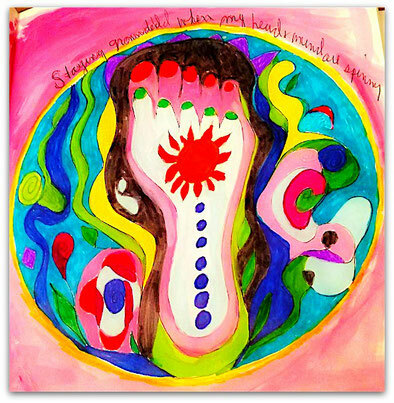 One theme I have used is a self-portrait where participants used their non-dominate hand to create a self-portrait. Here, they became less focused on getting it “right” and it enabled them to just have fun without a lot of judgement. What touches me most is how critical women can be when creating art. I see art making as a mirror and we talk about what it would be like to create art without judgement or criticism. It is very moving to hear their stories of trying to move past that critical voice and how the art can be a vehicle to promote self-awareness and gentleness towards oneself. One of the women who has been attending my workshop for almost a year, and comes monthly is a victim of domestic violence. She has shared how the workshop allows her to express feelings artistically. Here is a quote she shared recently: "I often find myself just really into the creating and having fun without planning too much what it will become, but suddenly start seeing things in the piece as it progresses, correlations/associations etc and it takes me to a whole another level (insight). And also that if it doesn't come out like I planned or wanted, it's okay!" One of things that is challenging for me is deciding whether or not to increase the fee I charge for my workshops. I buy all the supplies and give a donation to the adult center I use. I have a conflict about building my business and giving back to the community. I know the amount of work and planning I put into my workshops and therefore, I am in conflict about raising my fee and giving back to my community. Knowing the impact art has had on my life and sharing the love I have for creative expression with others. 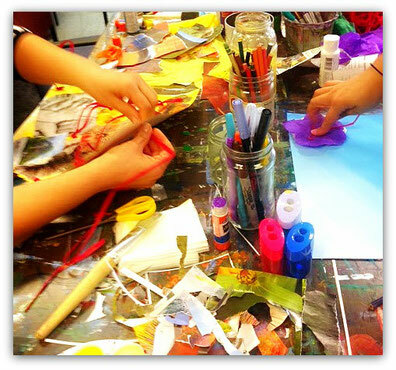 I also see how engaged participants become in the art making and that alone is so powerful. As a creator, I bring my caring and genuine nature to what I do. I bring my openness and witty spirit to my work. My creative and funky side to all I do in life makes people feel comfortable. There is not anything like my workshop in my community that I am aware of. I charge a very reasonable fee and am flexible with that fee if someone is unable to afford it. Women of all ages are welcome. It is not an art class, but a space to express feelings creatively. Oh my gosh, what a great question. They can support my work by “liking” my FB Page, by checking out my website and by spreading the word about the power of creative expression. My website is: www.arttherapyla.com. Feedback is always welcome and if you know of anyone in the Los Angeles area that might benefit by attending my workshops, please pass my information onto them. Thank you!